All these poems about music and artists are a result of an initiative by children's author Christina Gabbitas. Children were invited to write an eight line poem. 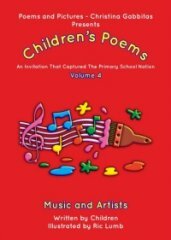 All these eight line rhyme poems are about Music and Artists, penned by children ages 7-13 from the UK and Sharjah, United Arab Emirates.This poetry book is the result of the initiative , and has also been published to help encourage and inspire other children of primary age to read and write. We met Christina in WHSmith, Sheffield whilst signing her own books. We bought a copy of this for our niece and she loves it. Good luck to all the children. The joint winning entry Music by Fidha Labeeb is very evocatively written. We met Fidha who signed her poem for us. I listened to Yanny Zaynchkofsky read his poem live on BBC Hereford & Worcester, an amazing accomplishement for a nine year old. 'Painting a Rainbow' is my favourite. Amazing writing for such young children. Another fantastic collection of poems. It's refreshing to see younger children taking part in a competition like this one. Good luck to all the children involved. This is the first year of judging for me and feel very privileged to have been asked. I was astounded at the level of writing. A great book, the children's poems are brilliant! My niece loved taking part in this competition. We love her poem. A great collection of poems for children.